About General Wire Spring Company. Started in business in 1930. From our McKees Rocks, Pennsylvania plant, we serve over a thousand customers throughout the United States and Canada. 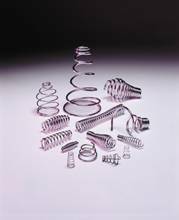 We manufacture compression springs, extension springs, torsion springs, and wire forms. We are equipped to process material in the range of .012" to .625". Normally, quotations are given in one business day or less. Depending on the number operations and material requirements, our standard lead times range from two through five weeks. We can generally accommodate rush orders. Our pricing is based on making a single production run. To give the customer the best quantity prices we will make split shipments over a reasonable period of time, usually six months. We price and produce goods to print or per sample. We do not make substitutions or revisions without the Customer's permission. We routinely review spring designs and make recommendations to improve quality or reduce cost when applicable.